2019 is flying past and as we enter the Scottish spring we look back at some of the key achievements of March. There has been some really exciting progress with PARSEC as well as a variety of update releases from the front end team. Each and every team has been working on some developments this month so lets get into the details. 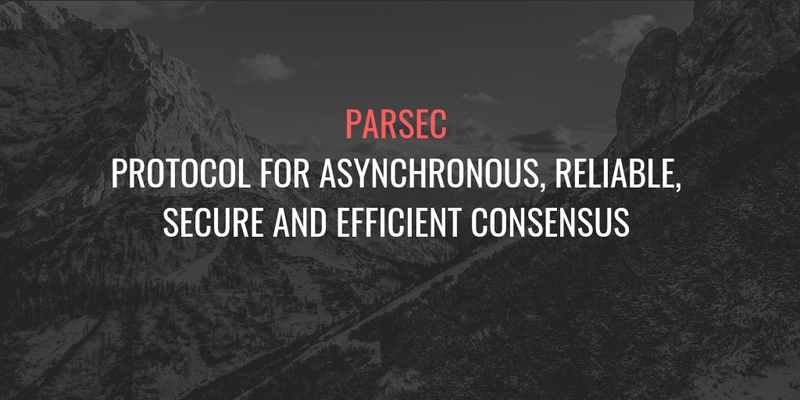 If we start off with a look at some of the technical progress that has been made this month, first up has to be the submission of the updated PARSEC whitepaper to the Journal of Parallel and Distributed Computing. This latest Whitepaper highlights the improved algorithm which is now fully asynchronous. We are excited to have made this move from highly to fully asynchronous ABFT consensus and look forward to sharing it with you all as soon as the peer review is complete. Yet again the front end team have been busy and have now released the latest versions of both the SAFE Browser (v0.12.0) and SAFE App nodejs API (v0.11.0). As well as technical updates the SAFE App includes improved documentation which we hope will help developers better understand how the package is structured and be able to get more involved in the project. Following intensive research, the front end team have also started exploring the idea of having a SAFE Authenticator CLI as we understand that GUI is not suitable for all situations and developers. The new CLI will interact directly with SAFE Client Libs with Rust and we are looking forward to hearing how your feedback. And if that wasn’t enough there has also been a release of the SAFE messages mobile app as an updated PoC. 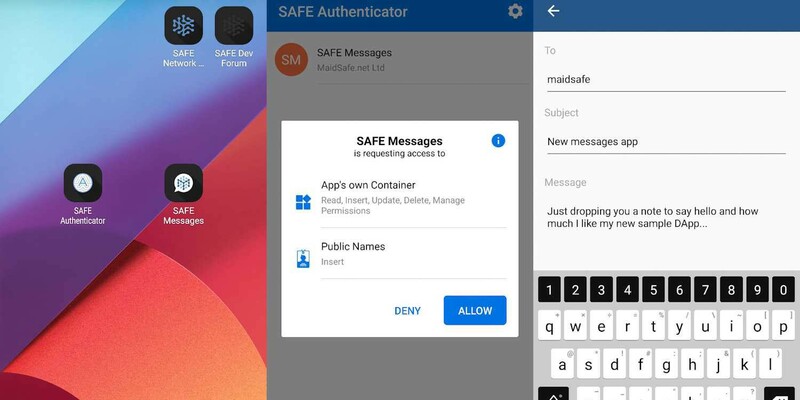 You can download the v0.1.1 APK from GitHub which will showcase how to use the MaidSafe.SafeApp NuGet to build a simple email application for mobile devices and hopefully inspire you to create a SAFE DApp of your very own. Now let’s turn our attention to the Crust team. This month there has been extensive work to code almost the entirety of Crust using QUIC from the quinn Rust crate and test this implementation to see what it brings us. The biggest benefit of this move would be the industry standard TLS which would simplify many of the processes currently needed in Crust. QUIC is basically what Crust was intended to be. Of course, we have our own parts, such as random ports, restarts, bootstrap cache, etc. but fundamentally the underlying protocol is close to perfect for us. In addition, it means SAFE engineers no longer need to be network protocol designers and that itself is a huge boost for us. The hope here is that with QUIC we can align with new Internet standards and simply use the protocol that now meets our requirements of security and accessibility. Very exciting to work with this protocol and see just how the rest of the Internet is seeing things as we did so long ago. In essence, this test, if successful, means we can focus on SAFE and less so on any network protocols. We have also been treated to two more posts in the Road to Fleming Forum series from the Routing team. First up was an explanation of Sybil Resistance looking at how the SAFE Network plans to deal with Sybil attacks. The second looks in more detail and tests some of our design ideas in a series of simulations. There has been some great discussion on all of this forum series so far and we continue to welcome your thoughts and comments as we move towards SAFE Fleming. March was also home to the latest Meet up in Brighton. 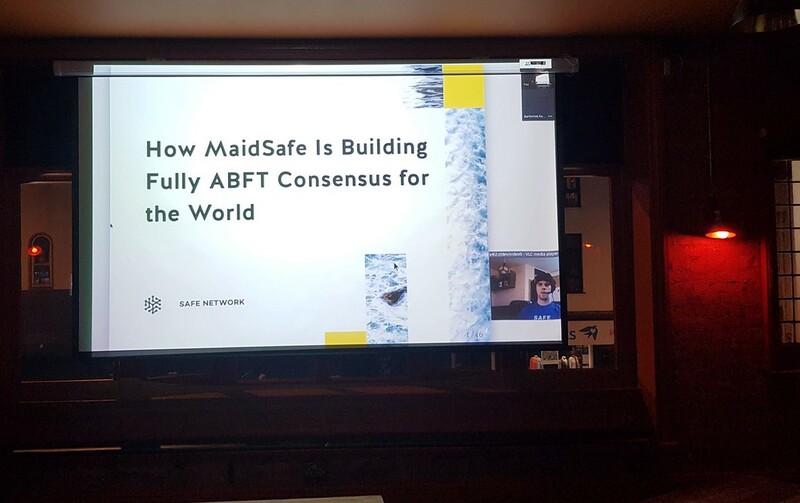 Attendees were treated to an introduction to the SAFE Network by Dug followed by an exclusive look into the new fully asynchronous PARSEC algorithm with Bart. Thanks to everyone who joined us, if you missed it don’t worry there is one already in the diary for May or check the forum to see if there is one coming up closer to you or if you fancy hosting one yourself. Calling all developers! What do you think of the DevHub additions? The DApps page has had an update and now features some of the amazing DApps created by our talented community. If you are looking to get started developing for the SAFE Network, the DevHub is a great starting point and remember there is always someone friendly and willing to help on the forum if you get lost! Speaking of our wonderful community, we hosted a two part interview on our Medium publication with community developer Edward this month to discuss him, his motivations and most recent SAFE Network contributions. We love to see the wider community developing so if there is anything your working on and would like to share, get in touch! As the MaidSafe team continues to grow we thought we would start a short video series to introduce some of them to you. To give you an idea of not only what they do, but how it impacts the development of the SAFE Network everyday. We started off the Designer Jim speaking all things UI and UX and also met Testing and Release Manager Stephen who heads up the QA team. We have a few more faces lined up but who are you most interested in hearing from? It is with some sadness that we are saying goodbye to 2 of the team this month. Douglas and Povilas are moving onto new adventures and although they will be missed we wish them all the best and no doubt we will continue to see them on the forum. We are therefore looking for an expert Network Engineer to join our fast-paced team, if you think your skills and ideals match the SAFE Network please email careers@maidsafe.net for more information.